Silver Number 8 Turquoise Statement Necklace by Adam Fierro. Silver Number 8 Turquoise Statement Necklace handmade by the amazing Adam Fierro. 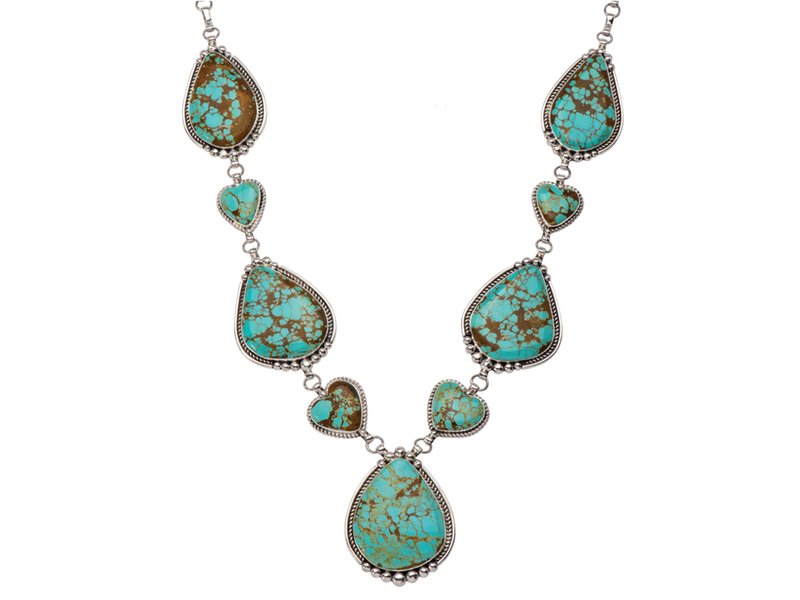 This striking necklace features beautiful pieces of number 8 turquoise set in sterling silver. The teardrop shape pieces of turquoise measure from the top 2 1/2″ inches long by 2″ inches wide, the hearts are 1″ inch long by 1″ inch wide, the next set of teardrop pieces of turquoise are 2 3/4″ inches long by 2 3/4″ inch wide, the hearts closest to the bottom are 1 1/4″ inch long by 1 1/4″ inch wide, The center pendant is 2 3/4″ inch long by 2 1/4″ inch wide. The total length of the necklace is 30″ inches long. The number 8 mine was presumably discovered about 1925 by a barber from Carlin whose name has been forgotten, because he made no attempt to mine the property. The mine was rediscovered by Earl Buffington and Lawrence Springer in 1929. 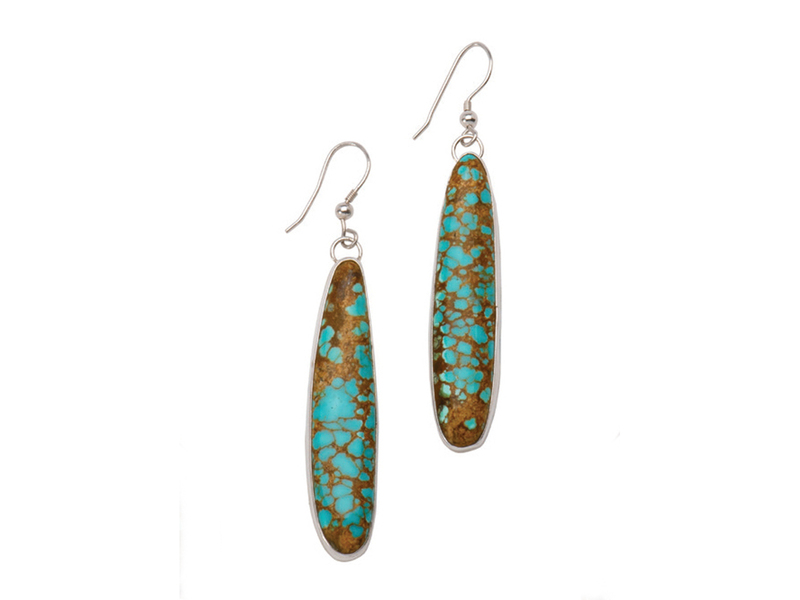 They filed formal claim to the property and proceeded to mine turquoise in serious fashion, producing about 1,800 pounds of good stone the first year. In 1930 Ted Johnson bought Buffington’s interest and during the next four years produced about 5,000 pounds of commercial stone. In 1935 Doc Wilson bought the number 8 mine from Johnson but did nothing with the property and the claim lapsed. Myron Clark relocated the claim and, after working it for awhile, sold it to Lee Hand. Hand operated the mine for a short time, but became dissatisfied with the quality of the stone, and sold it to the five Edgar brothers who now own it. The Edgars extended operations and produced a considerable amount of fair-to-good turquoise. 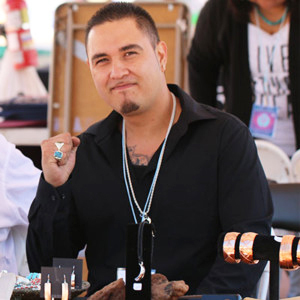 Adam Fierro was born in Gallup, New Mexico and is a descendant of the Santa Clara Pueblo and Mescalero Apache tribe. He started working with jewelry at the early age of six with his father and grandfather. He is a third- generation silversmith and jewelry artist. Fierro finds his inspiration from his Native American heritage and what the stone dictates. 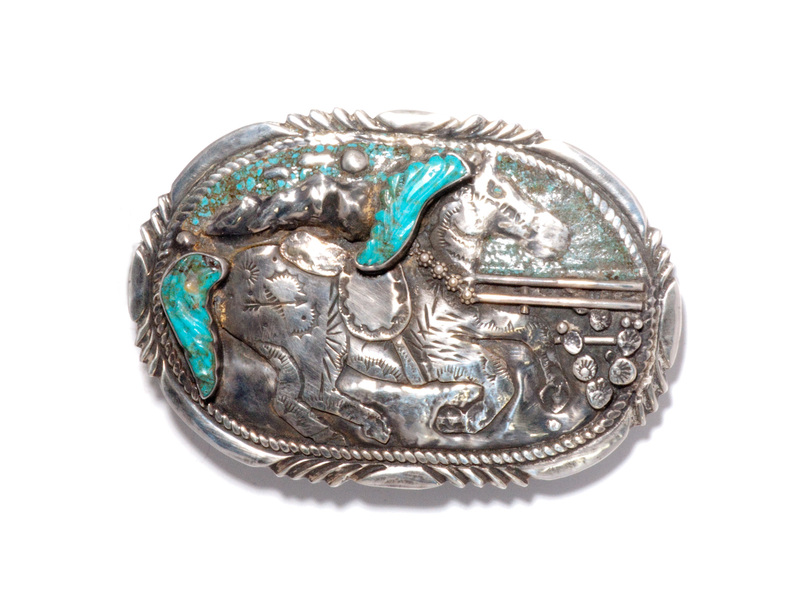 “Turquoise has a story, each and every stone,” say Fierro. “It chooses what it wants to be and I let it guide me.” His jewelry is a contemporary style with a bit of Southwestern influence and excellent craftsmanship. To own a piece of Adam Fierro’s jewelry is to own a work of art with a story unto its own.